The large earth bumble bee is a threat to the environment and primary production. Potential impacts include reduced seed production of native plants and increased seed production of introduced plants. Bumble bees are established in Tasmania. 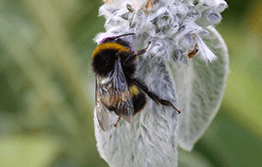 If you think you have seen a bumble bee anywhere in Australia other than Tasmania, call 1800 084 881. The social large earth bumble bee is hairier and larger than the honey bee or the European wasp. It is black, with one yellow/ochre band across the front of the thorax and another across the abdomen. The tip of the abdomen is white. The pest is spread through human activity.